Lead economists in the construction industry project continued modest growth in 2019, but caution that rising interest rates among other factors will threaten overall growth in the long term. “Despite month-to-month fluctuations, the outlook remains positive for modest to moderate increases in most [construction] spending categories at least through the first part of 2019. However, damaging trade policies, labor shortages and rising interest rates pose growing challenges to contractors and their clients,” says Ken Simonson, chief economist for Associated General Contractors of America. Dodge forecasts single-family home starts sliding 3 percent. Total U.S. construction starts are projected to reach $808 billion, essentially even with the $807 billion estimated for 2018, according to the 2019 Dodge Construction Outlook. By major sector in dollar terms, residential building will be down 2 percent, nonresidential building will match its 2018 amount, and non-building construction will increase 3 percent. “Over the past three years, the expansion for the U.S. construction industry has shown deceleration in its rate of growth, a pattern that typically takes place as an expansion matures,” Dodge Data & Analytics Chief Economist Robert Murray told attendees of the 80th annual Outlook Executive Conference in National Harbor, Md. “After advancing 11 percent to 14 percent each year from 2012 through 2015, total construction starts climbed 7 percent in both 2016 and 2017, and a 3 percent increase is estimated for 2018. 2019 vacancy rates are expected to rise as the economy slows, slightly dampening construction for offices and warehouses. Among key segments measured in year-over-year terms, the 2019 Dodge Construction Outlook predicts construction starts for single-family housing to be 815,000, down 3 percent; multifamily housing, 465,000, down 8 percent; and, commercial building, down 3 percent. On a positive note, institutional building, manufacturing plant construction and public works construction will see positive gains of 3 percent, 2 percent and 4 percent, respectively. The slight decline in homebuyer demand, notes the Dodge forecast, is the result of higher mortgage rates, diminished affordability, and reduced tax advantages for home ownership from tax reform. In fact, sales of newly built, single-family homes fell to a seasonally adjusted annual rate of 544,000 units in October—the lowest sales pace since December 2016—according to newly released data by the U.S. Department of Housing and Urban Development and the U.S. Census Bureau. 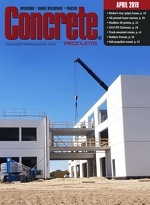 Corresponding to the deceleration in construction starts, the Portland Cement Association Market Intelligence Group cement consumption forecast paints a limited growth pattern from 2017 levels, with this year trending a 2.9 percent gain, followed by 2.6 percent and 1.6 percent bumps in 2019-2020. PCA’s overall projection for the U.S. economy suggests considerable strength that will take time to unravel. The seeds of a gradual softening will surface from rising interest rates; emergence of state-level fiscal difficulties at a time of relative prosperity; and, aging of the recovery. PCA forecasts the GDP growth rate to be 3.1 percent this year, 2.7 percent in 2019, and 2.2 percent in 2020. The unemployment rate now below 4 percent is expected to trend down—intensifying labor shortages and leading to stronger wage gains. The omnibus federal appropriations bill passed in March provided greater funding for transportation projects that will carry into 2019. Against this year’s volume, Dodge Construction Outlook predicts 2019 multifamily housing activity will slide 6 percent in dollars and 8 percent in units. Thanks to the strong economy, producers saw modest growth this year despite severe weather impacting key markets in the third quarter, and hope to continue that momentum in 2019. Martin Marietta Materials Inc. reported record results for the third quarter ended September 30, with total revenues of just over $1.2 billion versus just under $1.1 billion for the prior-year period. The SmartMarket Report aims to analyze the level of green activity; impact of green building practices on business operations; plus, triggers most likely to spur further green market growth and challenges that may impede it. Among the latter, Dodge researchers find the perception that green building methods cost more than traditional construction has declined from over three quarters of 2012 survey respondents to under half this year. Dodge Data & Analytics undertook World Green Building Trends 2018 SmartMarket Report research in partnership with Carrier and support from the American Institute of Architects, Autodesk, U.S. Green Building Council and World Green Building Council.